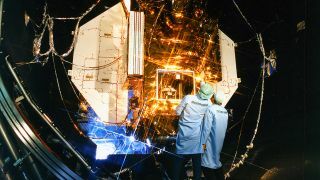 This week will likely provide you with your very last opportunities to get a glimpse of a big German satellite, first put into orbit back in June 1990 and which has been dormant since February 1999. The decommissioned German X-ray space observatory, called the Roentgen Satellite or ROSAT, will likely re-enter Earth’s atmosphere sometime between Oct. 22 and 24. ROSAT is currently moving around the Earth in a nearly circular orbit at an altitude of about 145 miles (236 kilometers) at an inclination of 53 degrees, which means that it is visible from virtually all inhabited regions on Earth. ROSAT is a relatively small satellite, so unlike the International Space Station or China's Tiangong space laboratory module, the defunct X-ray space observatory — while a naked-eye object — isn't a particularly bright object. Astronomers measure the brightness of sky objects using the magnitude scale, in which low numbers correspond to bright objects. In terms of ranking, the International Space Station usually reaches a brightness of about -2 to -4 magnitude, equaling or even rivaling the planets Jupiter and Venus. The brightest stars, such as Vega or Deneb have magnitudes of zero or one. A fairly bright star like Polaris (also known as the North Star) is categorized as 2nd magnitude, while stars of medium brightness are 3rd magnitude and faint stars are considered to be 4th magnitude. Megrez, the star that joins the handle with the bowl of the Big Dipper, is a 3rd magnitude star. ROSAT appears generally between third and fourth magnitude. So, unlike the space station, which can easily be seen from a brightly-lit city, you’ll need to have access to a reasonably dark sky to see ROSAT. In addition, because it's probably tumbling during its final days in space and because this 2.4-ton satellite is irregular in shape, ROSAT may appear to "blink" or "flicker" in brightness on its track across the sky. It might even "flare" briefly in brightness as it catches a glint of reflected sunlight and directs it toward you. Ted Molczan, the moderator of the SeeSat Internet mailing list, utilized 12 sets of orbital elements obtained from the U.S. Strategic Command to derive a possible window for re-entry. His calculations suggest that ROSAT could re-enter anytime from Oct. 22 to 24. So these are the final days to catch a glimpse of the German satellite before it makes its fiery plunge through Earth’s atmosphere. This week, ROSAT should be visible at dusk as an evening object across most of North America, as well as Europe. Another great site is this one, which provides real-time satellite tracking and shows you at any given moment during the day or night over what part of the Earth ROSAT happens to be. Editor's note: If you snap a great image of based on the skywatching website data above and would like to share it for a possible image gallery or story, please contact managing editor Tariq Malik at tmalik@space.com.